Do I need a service again? So I haven’t dived in a while...and it’s now winter. What is the best way to store all equipment. Hard and soft. I would like to hang my wetsuit up as well cause the dive bag takes up loads of space, but heard it’s not a good thing to hang up a wetsuit. What advice can you guys give me as to storing equipment so it’s won’t get moldy, or damaged? Hi Tracy. I have no scientific evidence to support this, but I can tell you what works for me. For me the key to keeping my wetsuit usable after being stored a long time is two fold. I use the sink-to-stink enzyme soaking treatment to insure that the neoprene doesn’t stink to high heaven when I break it out again, and I roll it up in a dry box and keep it in a dry place in the house. I did just the opposite with my first wetsuit and had to throw it out. I like to keep my old suits for bug hunting where I might be rubbing on rocks more than usual. So my first suit I just rinsed without the enzyme soak (who cares an old suit right?) and then packed it in an old dive bag in my damp garage. Not a good idea. My second wetsuit is rolled up in a box and stored in the house. I break it out now and then and no problems. I roll it to avoid any hard creases. Seems to work. Hope this helps. Lol. Ron, would love to dive all year round, though lack of shore diving buddies and cold are a factor. 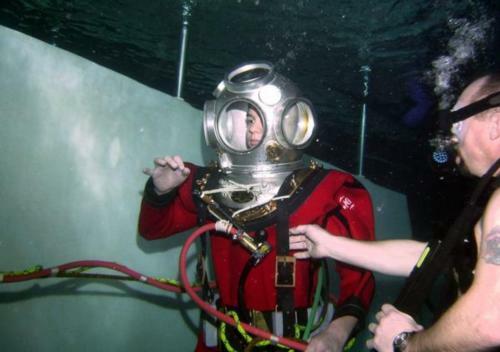 Dry suit is very very expensive and so is the course. Don’t do like my daughter and use the mesh divebag as a doorstop. The cat would lay on it and everything was covered in cat hair! I just hang my suit up in the basement. I have the wetsuit hangers, BC hangers, etc. I keep an eye on them and if I need to I’ll resoak them then hang them back up. Of course the best thing is not go long periods of time without diving. I belong to different dive clubs and can always find a divebuddy. I usually have all my gear serviced at the beginning of dive season that way I’m confident that regs and BC are alright. BTW, I splurged and the did drysuit thing... luv it! I leave my wetsuits and drysuits hanging in the garage all summer and all winter. Still diving the same 12 year old drysuit I’ve been storing this way the past 10 years. Still have my wetsuit from 11 years ago hanging there, too, and it’s OK except I’m too fat for it now. The second wetsuit (3 years old and fits me) is hanging right next to it and has survived 3 summers and 2.5 winters here. When they are not hanging, they are rolled or folded up in the bed of the truck, riding back and forth to dive sites in the sun and the rain. I do take the time to unfurl and let them dry out when they get wet (from rain or from diving). Then back they go to the devil-may-care storage situation. That said, I am a great fan of the dive all year solution. Buy yourself a used drysuit. You can find them for a couple hundred bucks on eBay (probably cost you a fortune to ship half-way round the world, though). Dive Buddy sign guarding our equipment during surface interval at Blue Grotto in FL.